Join the early birds to the Birthday Parade in search of the Golden Sonnet! Shall I compare thee to a summer’s day…? Many people recognise this line as Shakespeare’s work, maybe even that it is the beginning of one of the Bard’s most famous sonnets, but do you know which one? Shakespeare wrote 154 sonnets in all, and that one is number 18. Visitors to Stratford-upon-Avon for Shakespeare’s 453rd Birthday Celebrations on 22nd April should be on the lookout for this or the many other sonnets of Shakespeare being distributed to the crowds as they gather along the route of this year’s Birthday Parade through the town centre. 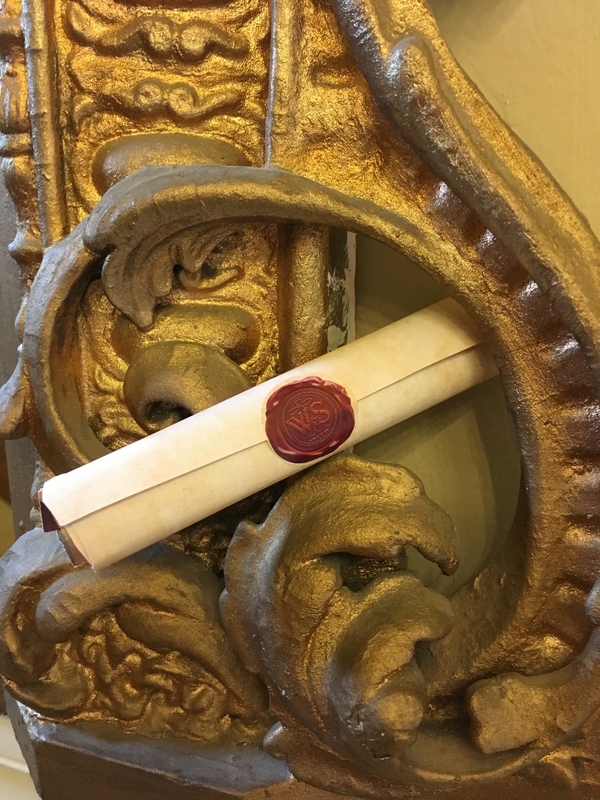 From just after 9:30am students of the Bard’s former place of learning, King Edward VI School, will give away hand held Birthday Celebration flags and scrolls bearing Shakespeare’s sonnets. There are 10,000 scrolls, each with a Sonnet printed inside and individually cut, rolled and secured with the seal of ‘WS’ denoting William Shakespeare. Each is a keepsake in its own right of this special day marking the 453rd birthday of the town’s most famous son. But there is more to entertain and excite spectators as they carefully break the seal to discover which sonnet they have and whether they have a prizewinning ‘Lucky Sonnet’. The Mayor of Stratford-upon-Avon, Juliet Short said: “We wanted to present people with a memento of their visit to the 453rd Birthday Celebrations, as last year’s free Shakespeare masks were such a success. The sonnet is a perfect link to the rich legacy left to us all in William Shakespeare’s writing. Local businesses and organisations in Stratford-upon-Avon have generously donated a fabulous array of prizes ranging from a refreshing cup of tea during the Celebrations weekend, free entrance to local exhibits, as well as beauty treatments and other products. One very fortunate recipient will open the ‘Golden Sonnet’ containing a superb collection of hospitality prizes gathered together from its business members by Shakespeare’s England, the official destination management organisation for Stratford-upon-Avon, Warwick, Kenilworth, Royal Leamington Spa and the surrounding towns and villages. It includes an overnight stay at one of Stratford-upon-Avon’s top hotels, the Welcombe Hotel, Golf Club and Spa, entrance to Shakespeare’s Family Houses, a visit to Shakespeare’s Schoolroom & Guildhall and a chance to visit the RSC’s exhibition, ‘The Play’s The Thing’ at the Swan Theatre . All the lucky winner has to do is be there, in the right place at the right time! Town Clerk, Sarah Summers added: “In organising Shakespeare’s Celebrations, we at the Town and District Councils depend very much on the support and goodwill of every organisation in and around Stratford-upon-Avon, so we are especially grateful to all the local businesses who have been kind enough to provide us with prizes for our Lucky Sonnets. “Each winning scroll contains a paper slip with details of the prize and when and where it should be claimed. Each slip is embossed with the Town Council’s badge as evidence of its authenticity – it can’t be replicated, so only the genuine article will suffice! The Bard is acknowledged as a writer of a particular style known as the ‘English’ or ‘Shakespearean’ sonnet – but he didn’t actually invent it and he wasn’t the first to write sonnets in the English language. The Shakespearean or English sonnet typically has 14 lines, structured as three different rhyming four-line sections, followed by a two-line rhyming couplet to conclude. The sonnet has been used by many poets in many languages since it was invented in the Middle Ages, reputedly by a Sicilian writer, Giacomo da Lentini. During the reign of Henry VIII, English poets such as Sir Thomas Wyatt and Henry Howard, Earl of Surrey, introduced it at court. Since then poets have found new and various ways to use it– it’s been a love poem, an elegy, a nature poem, an argument, a poem of remembrance, and more besides, according to the website, www.interestingliterature.com. For a full list of the organisations who have kindly donated prizes click this link: Thank You Lucky Sonnets Prize Givers. It will also appear on the printed programme available at the Birthday Parade on Saturday 22 April 2017.